We will help you make educated buying decisions whether you are buying your first paintball gun or own a ton of paintball guns. ANSgear.com has been in the paintball business for over 20 years offers a full line of paintball guns, paintball gear and paintball accessories. As you browse our site, you will see we carry the full product lines of many major paintball manufacturers such as Empire Paintball, PMI Paintball, Evil Paintball, Dye Paintball, Proto Paintball, Smart Parts Paintball, Redz Paintball, NXE Paintball, Warrior Paintball, Planet Eclipse, Virtue Paintball, Tadao Paintball, JT Paintball, Halo Paintball, Viewloader Paintball, ANS Paintball, Ricochet Paintball, V-Force Paintball, Draxxus Paintball, APE Paintball, Tippmann Paintball, Kingman/Spyder, Dangerous Power, BT, Invert Paintball, Custom Products (CP) and Many More. Hands down, we have the best Price Paintball Guns, Paintball Tanks, Paintball Packs, Paintball Gear, Paintball Loaders, Paintball Clothes, Paintball Masks, Paintball Barrels, Paintball Accessories and Paintballs. Now, our site also has Reviews on all of the paintball products we offer. Our reviews are written by customers who have either used or purchased that exact paintball product. These customer reviews are a vital part of picking out the right paintball gear to fit your needs. We have all the paintball gear you will ever need! Need help with your Paintball Gun or have a question about what is the right paintball gun for you? Give us a call or get us on live chat for our sales reps help in choosing the right paintball gun or part. 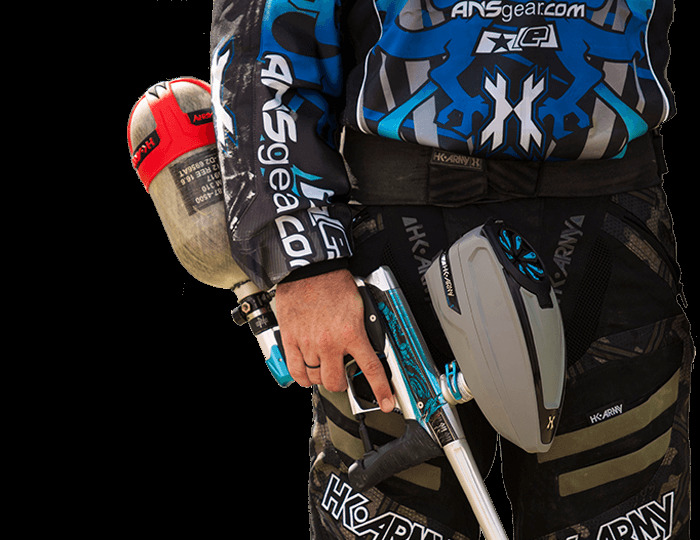 Here at ANS, we are constantly changing the paintball gear inventory so you get the latest and greatest paintball products on the market. We carry paintball gear from all new manufacturers and have more paintball skews in stock than any other online paintball retailer. Rest assured that when making your paintball gear purchase from ANS that your items will be handled with care and safely make it into your hands. Feel confident in your paintball gear purchase from ANS as we have expert industry knowledge and have the largest retail inventory of paintball gear in the world. Always know that our fully trained paintball gear professionals are here to help you make the right purchase for yourself or anyone else. Paintball Super Sale is the one and only place for you to find the best deals on ALL different types of paintball gear. Whether you are a beginning paintball player or advanced paintballer, we have the deals and best discount for you. Get the deal of your dreams and check out our paintball gear sale today. Most of the items in our sale paintball gear section are from previous years and are all brand new. Each year paintball manufacturers are out with the old and in with the new for most of their paintball guns as well as paintball gear. Our paintball sale will feature a selection of paintball gloves, paintball pants, paintball jerseys and paintball guns at a fraction of the current year pricing. On some lucky days you will be able to save up to 90 % on particular items. You will be able to pick up a ton of great paintball gear on closeout at the guaranteed best prices. Need somewhere to store your paintball gear or make it easier to all of your paintball gear to the field? Our paintball gear bag section has tons of great paintball gear bags, paintball gun cases and paintball backpacks. Paintball gear bags and paintball backpacks are unique from other bags because they are specially designed to hold particular items and keep them save. Most of the paintball gear bags and paintball backpacks have padded gun cases, tank cases and mask areas. Keep all of your paintball gear together and pick up your paintball gear bag. Choose the right size, style and color from your favorite paintball company. There are a few different things you want to look for when choosing a paintball gear bag. You will need to make sure that the paintball bag is the right size to hold all of your equipment. Some people want to hold all of their paintball gear while others only want to hold a small amount of their paintball equipment. When many people are choosing a paintball gear bag, they do not realize how much larger the bag will be once they receive it because online, the paintball bags tend to look smaller. Most of the paintball gear bags weigh between 18 and 25 pounds with no gear. Once they are filled with all of your paintball gear, the bag tends to weigh between 60-90 pounds and even more if it is loaded up with paintballs. The Dye paintball gear bag is one of the largest and most expensive paintball gear bags on the market. Each year the Dye paintball gear bag usually comes in two different sizes. One style is a full on paintball gear bag with a top and bottom half called the Navigator. The smaller of the two Dye paintball gear bags is the Explorer series which is great to haul one set of your own personal paintball gear. 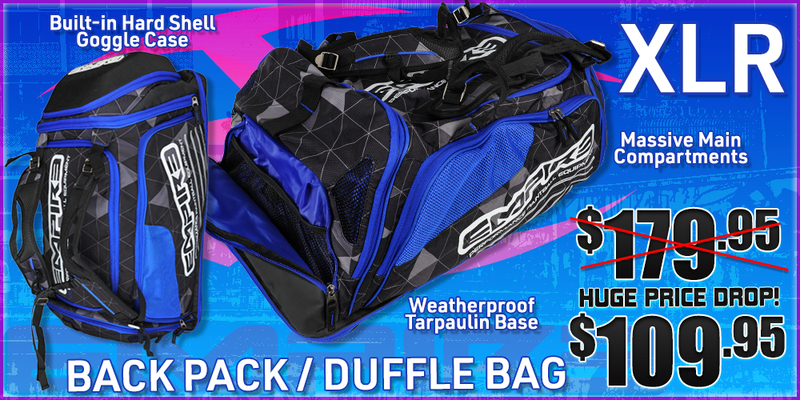 The Empire paintball gear bag comes in a variety of sizes with one suitable for a player with any amount of paintball gear. The Empire paintball gear bag has a ton of different compartments so you can have a save and secure place for your paintball gun and paintball gear. The Sly paintball gear bag is brand new and one of the higher priced bags. The Sly paintball gear bag is designed by paintball players, for paintball players. If you are looking for a large paintball gear bag that is built well and very light weight, then this is a piece of paintball gear that you need to have. The Redz paintball gear bag was the "original" must have bag in everyones paintball gear collection. The Redz paintball gear bag was designed to separate your paintball guns, paintball loaders , paintball mask and paintball tanks. The Redz paintball gear bag has not changed much over the years since they started with a very successful design. If you are looking for better accuracy out of your paintball gun, check out our great selection of paintball gun barrels. Our upgraded paintball gun barrels are sure to give you better accuracy and consistency. The stock paintball barrels are usually one of the first paintball gun upgrades so you will be more competitive on the field. We carry paintball barrels from every manufacturer in paintball and have the best deals in our barrel sale section. Our aftermarket paintball gun barrels are all micro honed and micro polished in order to give your paintballs unrivaled accuracy. Be sure that when choosing a paintball barrel for your gun that you get the right type of threading. There are about 15 different types of paintball gun barrel threads that have been produced over the years. The most common type of paintball barrel threading is for the Cocker or Auto Cocker series of paintball guns. That thread has been widely adopted in the paintball community and is now the basis for the majority of paintball guns that are being produced. If you are not positive what type of barrel your paintball gun takes, then give us a quick call so we can help you choose the one that will work with your paintball gun. There are 3 main types of paintball gun barrels. You can get a single piece paintball barrel, 2 piece barrel or paintball barrel kit. For the more basic players, a 1 piece paintball barrel will be perfect for you and your gun. The 1 piece paintball gun barrels are fairly inexpensive and most commonly retail between 12 and 50 dollars. If you are looking for a good brand of 1 piece paintball barrels then check out the CP/Custom Products 1pc collection. The CP 1 Piece paintball barrels will give you your choice between 5 different bore sizes, 4 lengths and over 15 different colors. Some of the high end paintball guns like the Eclipse Ego already have good quality barrels that would not need to be replaced unless you were upgrading to some type of paintball barrel kit. Our Paintball Clothing & Paintball Apparel selection is second to none and can not be beat. We guarantee to have the most current paintball clothing and paintball gear online. Do not miss your chance to find a paintball jersey, paintball gloves and paintball pants for under $50. Paintball gloves are great to keep your hands protected from the elements as well as the shell of paintballs. The shells of paintballs are a hard gelatin that can easily hurt your hand without protection. Paintball jerseys mostly come with padding and protection built into them which keep you cool on the field and give you some good protection. The most important of the paintball clothing would be your paintball pants. A good pair of paintball pants will have tons of knee protection as well as give you protection from paintball impacts. The paintball pants we offer are very durable and are long lasting. Paintball Drop Forwards, rails and ASAs will let you deck out your paintball gun the way you want. You can upgrade to an On/Off ASA or add a drop forward that will make your gun smaller and more compact. Paintball Drop Forwards come in a variety of sizes and allow you to adjust how compact your paintball gun is. If you want your paintball gun to be more compact then grab a big drop. If you want your paintball gun to be longer then a small drop forward will do just fine. If you want to mount different paintball asas, you may just need a paintball rail. Paintball rails screw onto your gun and allow you to mount a variety of paintball ASAs. Best selection of paintballs greatest moments brought to your door. Just when you thought you had all the paintball gear and paintball equipment you would ever need... The paintball DVD selection brings you paintballs best and most exciting games and action from both current years as well as the past. You may think you know paintball but after watching some professional paintball players, you will get a real lesson. If you aspire to take your paintball game to the next level then you found the right spot. If you are looking for some great strategic paintball or just a good video to hang out and watch, we have exactly what you want. We officially have the largest stock of paintball guns online. We carry paintball guns from all leading manufacturers including Azodin paintball guns, Bob Long paintball guns, BT paintball Guns, Dangerous Power Paintball guns, Dye paintball guns, Invert paintball guns, Spyder Paintball Guns, Eclipse paintball guns, Spyder paintball guns and Tippmann. We can guarantee you the best price paintball gear online and ensure you have a great experience when ordering your paintball gun. When choosing a paintball gun there are two key factors that should influence the decision. First, you should know the price range you want to spend on your new paintball gun. Paintball guns cost anywhere between $25 for a cheap paintball gun and can cost up to $2000 for a high end tournament paintball gun. When you know the price range you want to spend on a paintball gun, it will narrow down your search and let you focus on the paintball guns that are within budget. After you know the price range you want to spend on your paintball gun, you will then have to understand what type of paintball games you are going to play. Everyone has a different style of paintball game play which includes speedball, woodsball, recball, scenario, or tournament paintball. Tournament and speedball types of play would require paintball guns that are lighter weight and more compact. In the less expensive tournament paintball guns, you would be choosing from a selection of Azodin and Kingman/Spyder paintball guns. These paintball guns start at under $100 and max out at about $250. If you are looking for a middle priced paintball gun you would check out the selection of Invert paintball, Dangerous power and the more basic Planet Eclipse paintball guns. If you want the highest level paintball guns on the market you would want to check out the paintball guns from Bob Long, Planet Eclipse and Dye. If you are looking for a good quality paintball gun for scenario/woodsball/recball, you would want to check out the more durable and realistic paintball guns. The more realistic paintball gun assortment will include paintball gear from Tippman, BT and some Bob Long. These paintball gun brands are very durable and are modeled after actual guns. Paintball gun and paintball gear packages are a great place to get outfitted with everything you need all at one low cost. We have tons of paintball gear packages available for beginning to intermediate and advanced paintballers. We also have Paintball gear packages which include tournament upgrades for any paintball gun. Some of the paintball gear upgrade packages include HPA tanks, tournament paintball masks, and tournament loaders. Paintball gun upgrades is one of our most popular categories as it includes upgrades for all types of guns. We have a paintball gun category for all manufacturers and all of their paintball gun brands. Some of the most popular paintball gun upgrades are the boards, eyes, bolts, feed necks, barrels, regulators, grips and triggers. We have all the paintball gear you need to totally upgrade your paintball gun. The general paintball accessories are universal upgrades or parts that can be used with many different paintball guns. Some of the most common general paintball accessories are paintball batteries, holders for paintballs, paintball lubes, paintball grips, paintball remotes and squeegees to clean out broken paintballs. Paintball hoppers and paintball loaders are a very important piece of your paintball gear. They are the one limiting device on your gun that will control how many paintballs you can shoot. We have a hopper selection that will hold anywhere from 40 paintballs all the way up to 350 paintballs. 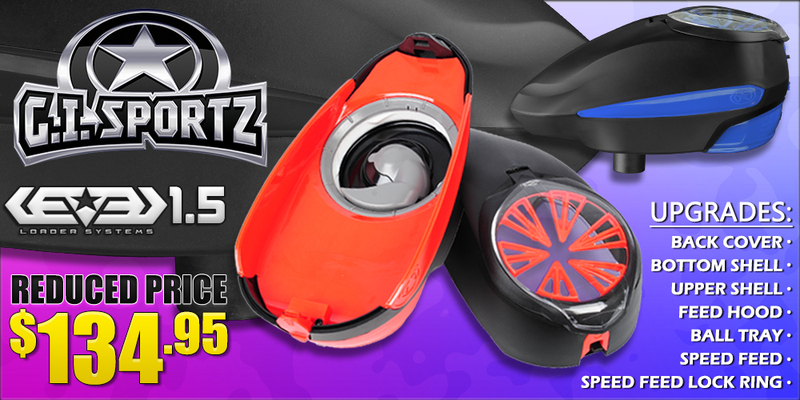 Also, our paintball loader selection will have a price for any player and start at just under $5. Paintball masks or paintball goggles or paintball goggles are important for any player who wants to stay safe on the field. 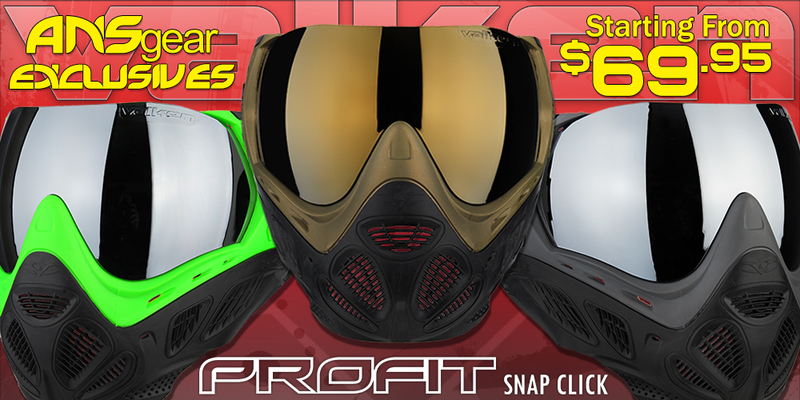 Our paintball mask section also has great aftermarket lenses and other accessories so you can customize your mask. Our recommendation is to invest in a good quality paintball mask that you plan on having for many years to come. Paintball pads and paintball protection will keep you padded and safe on the paintball field. The most common paintball protective gear would be your forehead protection, knee pads, elbow pads, neck protectors and chest protectors. The paintball chest protectors are worn right under your shirt or jersey. The paintball neck protectors are important because the neck is very soft and does not have a lot of muscle to take the impact. A thin neoprene paintball neck protector will absorb much of the impact from paintballs as well as keep the hard gelatin shell of the paintball from cutting or digging into your skin upon impact. Paintball knee pads and paintball elbow pads don't only provide protection from paintballs but also keep you comfortable and safe during a day of play. Both the paintball knee and elbow pads are worn under your jersey or your pants. The paintball pads are all made out of soft and flexible foam or gel which makes them very comfortable to wear for a full day of paintball. The Paintball pads slip over your wrist or elbow/forearm and are usually held securely in place with a couple of Velcro straps. Paintball head protection is also important since it is very common that paintballers get shot in the head or mask. Some of the most common paintball head protection options are hats, paintball beanies or headbands. Paintball beanies are great to wear because they will keep your entire head padded. They are great for some cold weather paintball but don't work so well for some of those summer paintball days. Paintball hats used to be very popular on the fields but they have been slowly taken over by the beanies and paintball head bands. Paintball head bands are probably the most comfortable because they offer ample forehead protection from paintballs as well as wick away any sweat from your head. We are proud to have the biggest selection of paintballs online. We have RPS Paintballs, Diablo Paintballs, DXS Paintballs, Empire Paintballs, Kingman Paintballs, WPN Paintballs, XO Paintballs, Tiberius Arms Paintballs, Valken Paintballs and Reusable paintballs. Our paintballs are always the freshest and every precaution is taken in order to make sure your paintballs all arrive in good condition. All orders of paintballs over $100 will ship out for free. Make ANSgear your one stop shop for your paintballs and all other paintball gear. Since we have been in the paintball business for over 20 years we have mastered the art of shipping paintballs to anywhere in the world without damage. Before any paintballs leave the ANSgear facility we first start by opening each case to look for paintballs with dimples or broke paintballs. If we find a case of paintballs with either of these flaws, the entire bag is pulled from the case. Once each bag of paintballs is inspected the cases are triple wrapped in bubble wrapping. This insures that the paintballs will not break once they are shipped out from the ANSgear facility. We really stress that all of our customers shoot fresh paintballs because more accurate and have good consistent shells and fills. All paintballs that are shipped from our facility are very fresh batches so you know you will have a good time at the paintball field. There are differences in both the costs and grades of paintballs. Normally when you purchase a less expensive case of paintballs, the fill inside of the paintball will be much more thin than on a mid or high grade case of paintballs. This will effect the marking characteristics of the paintballs and make it more difficult to see the paintball break on your opponent. Also, the low end paintballs do not have as much time to cure on the racks which means they are not as round, have more imperfections and therefore will not fly as straight. The middle grade paintballs usually retail for about $46-$55 per case. When you use a mid grade case of paintballs, you will have a much brighter and thicker fill. This makes it much easier to see the paintball break on your opponent and have them removed from the game. The shell of the mid grade paintballs is similar to that of the lower grade but has a lot more time to cure on the racks before being boxed up. This means that the mid grade paintballs are a lot more spherical and will be more accurate. The high end paintballs are distinctly different from both the low and mid grade paintballs. The high end paintballs are more commonly referred to as tournament paintballs. These paintballs have the brightest and thickest marking fill with other ingredients that make the fill of the paintball very hard to wipe. The shells of a tournament grade paintball are also more brittle and are made to shoot through the low pressure tournament paintball guns. The most common tournament paintball brands are Marballizer, Evil, All Star and DXS Gold. You Should only use a high end paintball if you know that you want to spend the money and that it will shoot well through your paintball gun. ANSgear has the largest paintball tanks selection online. We carry both CO2 and Compressed air paintball gun tanks and guarantee to have the best prices. 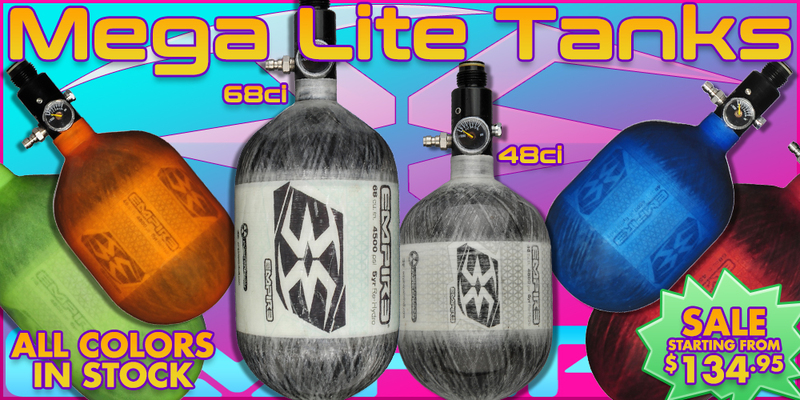 Our HPA paintball tank selection is second to none and all of our tanks are recently hydro tested. Also, be sure to grab any other paintball tank accessories you may need as we also have a ton of paintball tank parts, paintball tank regulators, paintball tank rebuild kits and paintball tank covers. Please be aware that your paintball gun tank is one of the most important pieces of paintball gear you will pruchase. A paintball tank is a necessary item to power any paintball gun. The two most common types of paintball tanks are Compressed air tanks and CO2 Tanks. Compressed air paintball tanks are a constantly regulated gas. CO2 tanks feed a combination of Liquid and Gas into the paintball gun in order to propel the paintballs. It is very important to purchase a paintball tank cover when you order your bottle. Most of the carbon fiber paintball tanks can easily be damaged which makes it so fields and stores will not fill the bottle. A paintball tank cover is an inexpensive investment that will not only keep your tank protected but will keep your paintball tank from being damaged. A paintball gift certificate is a great gift for anyone looking to stock up on some paintball gear or paintballs. You might not know how to spend it but the recipient will have thousands of paintball items to choose from to load up their gear bag. Don't forget that all of our paintball gift certificates ship for free and doesn't matter how much they are for. 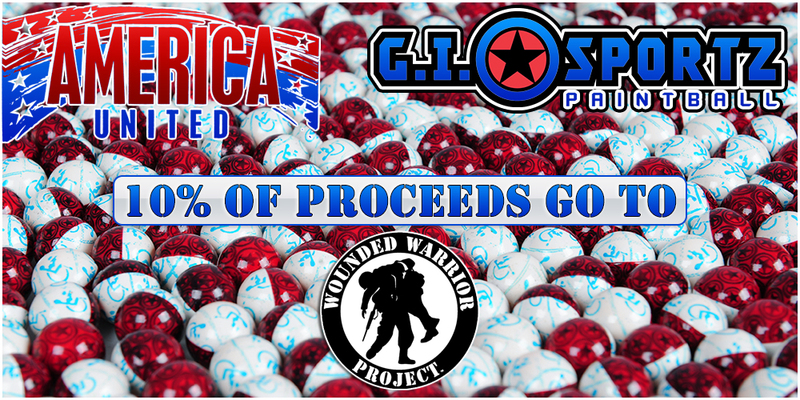 Also, the recipient will get free shipping for any paintball gear or paintballs that total over $100. The paintball gift certificate is just right for you if you are not sure if the sport is paintball or paint ball. Contact Us Direct 805-522-8700, Open a Support Ticket by Clicking Here, or View Our Live Online Support. If you are looking for a good priced paintball gun or gear then check out the lineup from BT. The BT Paintball guns are favorite among woodsball and scenario paintball players with their realistic look and feel. The Dye paintball gun line is top notch and used by many of the pro paintball teams. The Dye paintball gun is a spool valve design which has very little kick and is very easy on paintballs. The Dye paintball gun series starts retailing at just above $100. The Proto Series paintball gun is very similar to the Dye paintball guns but is a lot less expensive. Both of the companies are under the same ownership and their paintball gun manufacturing process is done in the same facility. There is also the Proto SLG paintball gun which is a basic electronic gun that is popular with beginning paintball players. The Invert paintball gun line is inexpensive and will give you some great firepower for the price. The Invert Mini series paintball gun is a very affordable and reliable paintball gun that is considered to be low to mid price. The Tippmann paintball gun company is the world renowned leader in manufacturing the most durable paintball guns on the market. All users know that if you want a low maintenance paintball gun that will always shoot when you pull the trigger, you need to go with a Tippmann paintball gun. The Tippmanns start their pricing at just about $100 which makes this one of the lowest cost paintball guns on the market. The Spyder paintball gun company has been in business since the inception of paintball. Spyder paintball guns are very good quality along with their entire line of paintball gear. If you are looking for a good quality paintball gun from a reputable paintball gun manufacturer then Spyder is just the thing you are looking for. The Eclipse paintball gun is one of the most highly regarded paintball guns on the market. Their top of the line paintball gear is second to none and their guns are used bye the majority of pro paintball teams. If you want to really be taken serious on the paintball field and have a liberal budget then check out all of the Planet Eclipse paintball guns and paintball gear. Dangerous Power paintball guns are fairly new to paintball but have taken off very quickly. The DP Paintball guns are very easy on paintballs and shoot very consistently and accurately. The Dangerous Power paintball gun is light weight and has many features that are similar to the $1000+ paintball guns. The DP paintball gun starts at under $300 and is available in a few different models. Bob Long paintball guns first hit the market in 2000 and quickly became known as the one and only real tournament paintball gun. As the years have passed, the Bob Long paintball gun has innovated and changed to stay ahead or inline with the competition. The Bob Long paintball guns are all manufactured and built right here in the US. Feel confident in purchasing a paintball gun from a great and long time paintball company.